The structures adopted by Bi2O3 differ substantially from those of arsenic(III) oxide, As2O3, and antimony(III) oxide, Sb2O3. Existence domains of the four polymorphs of Bi2O3 as a function of temperature. (a) The α-phase transforms to the δ-phase when heated above 727 °C, which remains the structure until the melting point, 824 °C, is reached. When cooled, the δ-phase transforms into either the β-phase at 650 °C, shown in (b), or the γ-phase at 639 °C, shown in (c). The β-phase transforms to the α-phase at 303 °C. The γ-phase may persist to room temperature when the cooling rate is very slow, otherwise it transforms to the α-phase at 500 °C. Bismuth oxide, Bi2O3 has five crystallographic polymorphs. The room temperature phase, α-Bi2O3 has a monoclinic crystal structure. 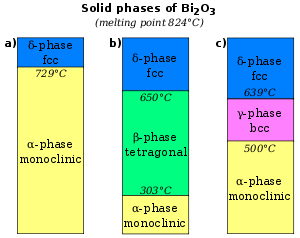 There are three high temperature phases, a tetragonal β-phase, a body-centred cubic γ-phase, a cubic δ-Bi2O3 phase and an ε- phase. The room temperature α-phase has a complex structure with layers of oxygen atoms with layers of bismuth atoms between them. The bismuth atoms are in two different environments which can be described as distorted 6 and 5 coordinate respectively. β-Bi2O3 has a structure related to fluorite. γ-Bi2O3 has a structure related to that of Bi12SiO20 (a sillenite), where a fraction of the Bi atoms occupy the position occupied by SiIV, and may be written as Bi12Bi0.8O19.2. δ- Bi2O3 has a defective fluorite-type crystal structure in which two of the eight oxygen sites in the unit cell are vacant. ε- Bi2O3 has a structure related to the α- and β- phases but as the structure is fully ordered it is an ionic insulator. It can be prepared by hydrothermal means and transforms to the α- phase at 400 °C. The monoclinic α-phase transforms to the cubic δ-Bi2O3 when heated above 729 °C, which remains the structure until the melting point, 824 °C, is reached. The behaviour of Bi2O3 on cooling from the δ-phase is more complex, with the possible formation of two intermediate metastable phases; the tetragonal β-phase or the body-centred cubic γ-phase. The γ-phase can exist at room temperature with very slow cooling rates, but α- Bi2O3 always forms on cooling the β-phase. Even though when formed by heat, it reverts to α- Bi2O3 when the temperature drops back below 727 °C, δ-Bi2O3 can be formed directly through electrodeposition and remain relatively stable at room temperature, in an electrolyte of bismuth compounds that is also rich in sodium or potassium hydroxide so as to have a pH near 14. The α-phase exhibits p-type electronic conductivity (the charge is carried by positive holes) at room temperature which transforms to n-type conductivity (charge is carried by electrons) between 550 °C and 650 °C, depending on the oxygen partial pressure. The conductivity in the β, γ and δ-phases is predominantly ionic with oxide ions being the main charge carrier. Of these δ- Bi2O3 has the highest reported conductivity. At 750 °C the conductivity of δ- Bi2O3 is typically about 1 Scm−1, about three orders of magnitude greater than the intermediate phases and four orders greater than the monoclinic phase. The conductivity in the β, γ and δ-phases is predominantly ionic with oxide ions being the main charge carrier. δ- Bi2O3 has a defective fluorite-type crystal structure in which two of the eight oxygen sites in the unit cell are vacant. These intrinsic vacancies are highly mobile due to the high polarisability of the cation sub-lattice with the 6s2 lone pair electrons of Bi3+. The Bi-O bonds have covalent bond character and are therefore weaker than purely ionic bonds, so the oxygen ions can jump into vacancies more freely. The arrangement of oxygen atoms within the unit cell of δ-Bi2O3 has been the subject of much debate in the past. Three different models have been proposed. Sillén (1937) used powder X-ray diffraction on quenched samples and reported the structure of Bi2O3 was a simple cubic phase with oxygen vacancies ordered along<111>, i.e. along the cube body diagonal. Gattow and Schroder (1962) rejected this model, preferring to describe each oxygen site (8c site) in the unit cell as having 75% occupancy. In other words, the six oxygen atoms are randomly distributed over the eight possible oxygen sites in the unit cell. 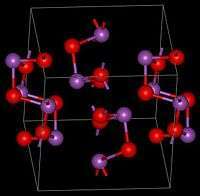 Currently, most experts seem to favour the latter description as a completely disordered oxygen sub-lattice accounts for the high conductivity in a better way. Willis (1965) used neutron diffraction to study the fluorite (CaF2) system. He determined that it could not be described by the ideal fluorite crystal structure, rather, the fluorine atoms were displaced from regular 8c positions towards the centres of the interstitial positions. Shuk et al. (1996) and Sammes et al. (1999) suggest that because of the high degree of disorder in δ- Bi2O3, the Willis model could also be used to describe its structure. Bi2O3 easily forms solid solutions with many other metal oxides. These doped systems exhibit a complex array of structures and properties dependent on the type of dopant, the dopant concentration and the thermal history of the sample. The most widely studied systems are those involving rare earth metal oxides, Ln2O3, including yttria, Y2O3. Rare earth metal cations are generally very stable, have similar chemical properties to one another and are similar in size to Bi3+, which has a radius of 1.03 Å, making them all excellent dopants. Furthermore, their ionic radii decrease fairly uniformly from La3+ (1.032 Å), through Nd3+, (0.983 Å), Gd3+, (0.938 Å), Dy3+, (0.912 Å) and Er3+, (0.89 Å), to Lu3+, (0.861 Å) (known as the ‘lanthanide contraction’), making them useful to study the effect of dopant size on the stability of the Bi2O3 phases. Bismuth trioxide is commercially made from bismuth subnitrate. The latter is produced by dissolving bismuth in hot nitric acid. Addition of excess sodium hydroxide followed by continuous heating of the mixture precipitates bismuth(III) oxide as a heavy yellow powder. Also, the trioxide can be prepared by ignition of bismuth hydroxide. Oxidation with ammonium persulfate and dilute caustic soda gives bismuth tetroxide. The same product can be obtained by using other oxidizing agents such as potassium ferricyanide and concentrated caustic potash solution. Electrolysis of bismuth(III) oxide in hot concentrated alkali solution gives a scarlet red precipitate of bismuth(V) oxide. Bismuth(III) oxide reacts with mineral acids to give the corresponding bismuth(III) salts. Reaction with acetic anhydride and oleic acid gives bismuth trioleate. 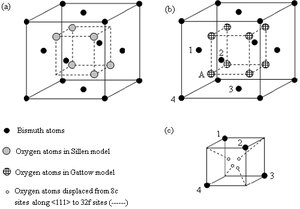 (a) Sillén model; vacancies ordered along<111>, (b) Gattow model; vacancies completely disordered in oxygen sub-lattice, with each oxygen site having 75% occupancy, (c) Willis model; oxygen atoms displaced from regular 8c sites (for example, the atom marked A in (b)) along<111> to 32f sites. The Bi3+ ions labelled 1–4 in (c) correspond to those labelled 1–4 in (b). 1 2 3 Patnaik, Pradyot (2003). Handbook of Inorganic Chemical Compounds. McGraw-Hill. ISBN 0-07-049439-8. Retrieved 2009-06-06. ↑ Malmros, Gunnar; Fernholt, Liv; Ballhausen, C. J.; Ragnarsson, Ulf; Rasmussen, S. E.; Sunde, Erling; Sørensen, Nils Andreas (1970). "The Crystal Structure of alpha-Bi2O3.". Acta Chemica Scandinavica. 24: 384–396. doi:10.3891/acta.chem.scand.24-0384. 1 2 Radaev, S. F.; Simonov, V. I.; Kargin, Yu. F. (1992). "Structural features of γ-phase Bi2O3 and its place in the sillenite family". Acta Crystallographica Section B. 48 (5): 604–609. doi:10.1107/S0108768192003847. ↑ Harwig, H. A. (1978). "On the Structure of Bismuthsesquioxide: The α, β, γ, and δ-phase". Zeitschrift für anorganische und allgemeine Chemie. 444 (1): 151–166. doi:10.1002/zaac.19784440118. 1 2 Gattow, G.; Schröder, H. (1962). "Über Wismutoxide. III. Die Kristallstruktur der Hochtemperaturmodifikation von Wismut(III)-oxid (δ-Bi2O3)". Zeitschrift für anorganische und allgemeine Chemie. 318 (3–4): 176–189. doi:10.1002/zaac.19623180307. 1 2 Willis, B. T. M. (1965). "The anomalous behaviour of the neutron reflexion of fluorite". Acta Crystallographica. 18 (1): 75–76. doi:10.1107/S0365110X65000130. ↑ Shuk, P.; Wiemhofer, H. D.; Guth, U.; Gopel, W.; Greenblatt, M. (1996). "Oxide ion conducting solid electrolytes based on Bi2O3". Solid State Ionics. 89 (3): 179–196. doi:10.1016/0167-2738(96)00348-7. ↑ Sammes, N. M.; Tompsett, G. A.; Cai, Z. H. (1999). "The chemical reaction between ceria and fully stabilised zirconia". Solid State Ionics. 121 (1): 121–125. doi:10.1016/S0167-2738(98)00538-4. ↑ Hutcheson, C; Seale, N. S.; McWhorter, A; Kerins, C; Wright, J (2012). "Multi-surface composite vs stainless steel crown restorations after mineral trioxide aggregate pulpotomy: A randomized controlled trial". Pediatric dentistry. 34 (7): 460–7. PMID 23265162. ↑ Camilleri, J (2014). "Color stability of white mineral trioxide aggregate in contact with hypochlorite solution". Journal of Endodontics. 40 (3): 436–40. doi:10.1016/j.joen.2013.09.040. PMID 24565667. Vannier, R. N.; Mairesse, G.; Abraham, F.; Nowogrocki, G. (1993). "Incommensurate Superlattice in Mo-Substituted Bi4V2O11". Journal of Solid State Chemistry. 103 (2): 441–446. Bibcode:1993JSSCh.103..441V. doi:10.1006/jssc.1993.1120.